This hexagon cafeteria table has ProtectEdge to prevent buildup of food and germs. Hexagon cafeteria tables are just what you need to shape up your lunchroom. They are designed for safety and convenience. An automatic lock engages when the table is moved to the open or closed position. The lock can be released from either side of the table, activating the torsion bar lift system for a one-person fold. The table can also be locked in a partially-open position for easy cleaning of the floor underneath. 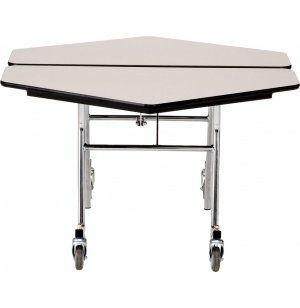 With extra safety features, these cafeteria tables are ideal for a busy lunchroom. 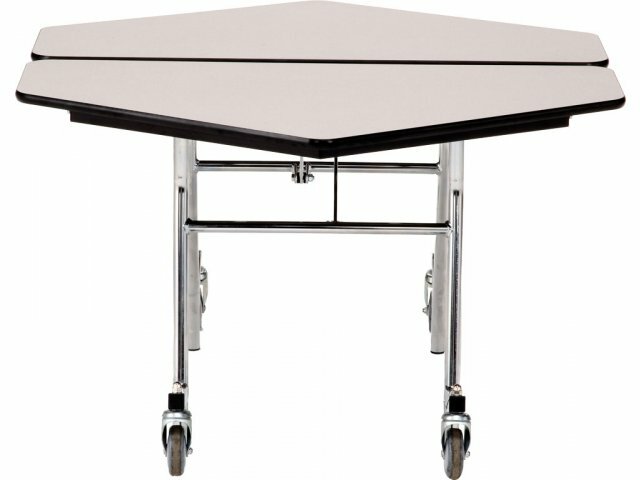 The casters automatically lift off the floor when the table is open and they do not stick out beyond the surface of the table. This ensures secure positioning and prevents tripping. Available with a choice of edge banding, core materials and frame finishes.